2014 Memorial Award recipient, James Cary and Board Member, Mary LaChappelle. Ryan's Memorial Fund provides an annual monetary award in Ryan's name to a deserving senior student at Windham Regional Technical School and will do so for a total of forty-eight years. We presented the school with a memorial plaque that has Ryan's photograph embossed on it and forty-eight plates for recipients' names. 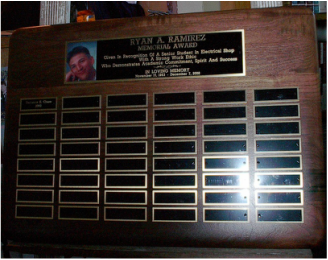 Each year as we present Ryan's memorial award, we include a driving safety message. See photo of plaque and most recent recipient below. 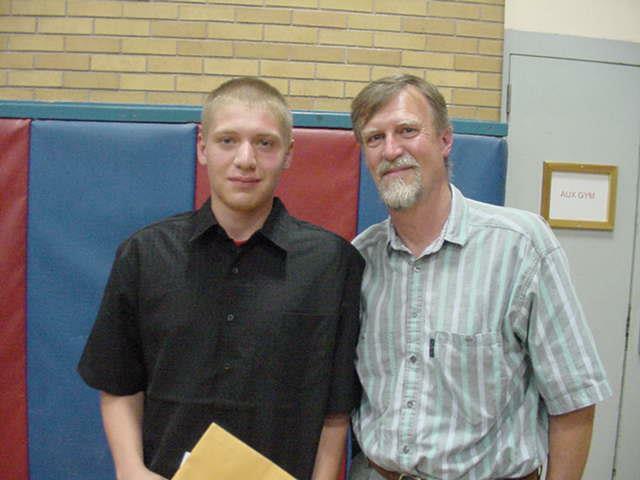 Jake Poulin, 2012 recipient of Ryan's memorial award, poses with Ryan's dad, Michael Chapman, at the awards ceremony.